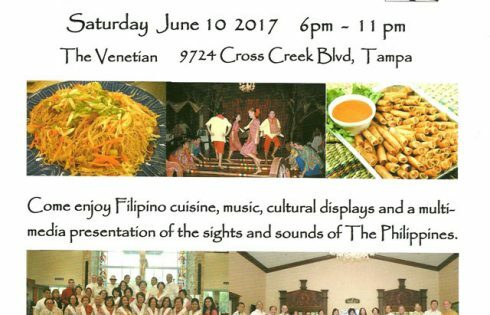 The St. Mark Filipino Choir and Couples for Christ proudly bring you Philippine Independence Day Fiesta 2017 on Saturday, June 10, 2017 from 6:00 PM to 11:00 PM at the Venetian Event Center of the St. Mark the Evangelist Catholic Church located at 9724 Cross Creek Blvd, Tampa, FL 33647. Philippine Independence Day Fiesta 2017 will mark the 119th anniversary of Philippine Independence where on June 12, 1898, it was proclaimed in Kawit, Cavite, Philippines. With the public reading of the Act of the Declaration of independence , Filipino revolutionary forces under General Emilio Aguinaldo proclaimed the sovereignty and independence of the Philippine Islands from the colonial rule of Spain. The celebration in Tampa will be marked with festivities, including various Filipino cuisine, cultural displays and multi-media presentation of sights and sounds of the Philippines. Musikong Kawayan Bamboo Ensemble and the Philippine Performing Arts Company, Inc., both from the Philippine Cultural Foundation, Inc., will be performing. Event tickets to Philippine Independence Day Fiesta 2017 are priced at $15, inclusive of food, a drink and dessert. For more information, please call Joe at (813) 716-7369 or Cris at (813) 817-6773.